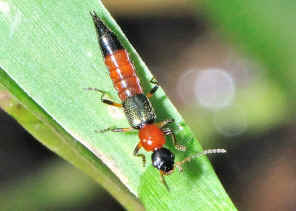 Family Staphylinidae - Rove Beetles - ? 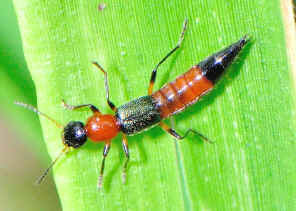 Paederus sp. 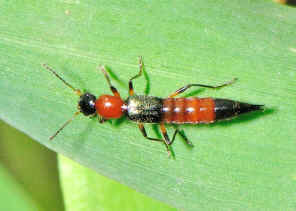 Staphylinidae is a large family although we seldom see them. They are from very small to small size. 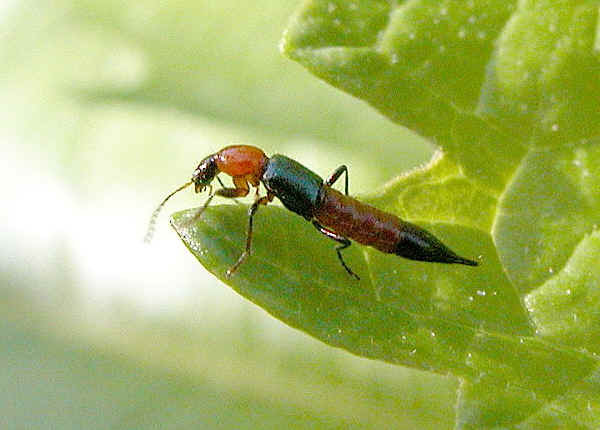 They are either predators or carrion feeder live in soil and leaf litter. 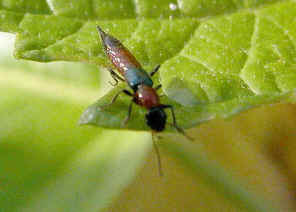 Usually they are elongated and half of their abdomen is exposed. The larvae are active with fully developed legs. We saw this beetle frist in Yugarapul Park on OCT 2004. It ran quickly on leaves. We occasionally found this beetle in wet Eucalypt forest. 1. Insects of Australia, CSIRO, Division of Entomology, Melbourne University Press, 2nd Edition 1991, p 624. 2. Beetles of South Australia, a guide to the Genera of, Part 2, E.G. Matthews, South Australia Museum, 1982, p 6. Last updated: April 14, 2011.